I don’t like to say I hate any part of the city, all the components blend together to form the whole I love so much, but Elephant & Castle roundabout doesn’t make it easy. The traffic is caught in a never-ending cycle of exhaust fumes and honking horns. The blazing summer sun makes me yearn for leaf-litter underfoot and mist in the air. No such luck today, light reflecting angrily off van windshields and grubby windows. I spill out of the station with the rest of the crowd, that rancid smell of rubbish, concrete and old tobacco acute and rotten in the heat. My bag is heavy with Key Stage 3 maths books, a thick pad of paper, a pencil-case, the hardback sci-fi novel I stupidly brought with me. Sweat stains my t shirt. 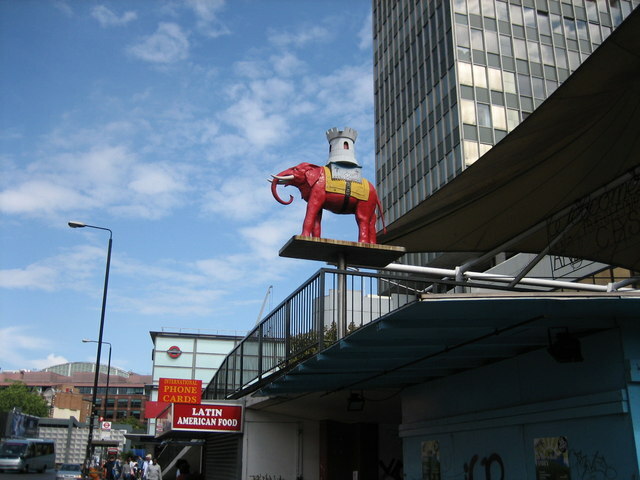 I pass the shopping centre and its sad pink elephant. It always reminds me of another artificial elephant, this one private and standing behind the locked gates of a house on Brondesbury Park. A garish orange-red pastiche standing next to a replica Chinese terracotta warrior, a Mercedes with tinted windows sitting in the driveway. ‘Money and no class,’ my girlfriend says. I’ve been working with my student for a few months now. He’s the youngest of a large Bangladeshi family who live on an estate just off the Walworth Road. Every Monday, Wednesday and Thursday I eat my lunch in this nondescript cafe next to Greggs, where a surly Polish man serves me a baked potato with beans and coleslaw. I read my book or the paper and try to ignore the television hung on the wall, permanently set to a music channel exclusively playing club hits from six-to-eight years ago. I plan my lessons as attractive women gyrate in strobe lighting on the screen. ‘Don’t go south of the river, son, it's bandit country,’ my dad said, always with a grin. The boy is twelve years old and he’s out of the education system, for good, forever. Stabbed a kid his age in the neck, nearly killed him, he’s getting caught up in the gang activity in the area or so his social worker tells me. I can’t help but imagine the blood. You wouldn’t know it to look at him, he’s twelve but is scrawny and looks younger, sinewy and with too much energy. His mother speaks no English and his father is old and odd and speaks no English either, which is fine. I’m used to that. Sometimes his older brother is in the house, he must be twenty-five and looks at me in a strange way which may be aggressive or maybe it’s my imagination. I’m a stranger coming into their home and maybe that's strange. The boy is very intelligent, we whip through the workbooks at a great pace. He excels at maths. and I get perverse pleasure imagining headlines in the Metro and on BBC London News, talking of the family who gunned down the tutor who was there to help their son, wasn’t it a tragedy, the system failed him. Then the police call, detectives, they want to come take a statement from me so that evening we stand in the tiny kitchen in the tiny flat I occupy behind the Hackney Empire, and I relay my story to them, they try and put words in my mouth but I try and keep it accurate and impassive and near the end of the statement I have to help one of the DIs spell the word ‘bangladeshi’.